Want a new you? Today’s modern dental technology allows us to change your smile and your life. 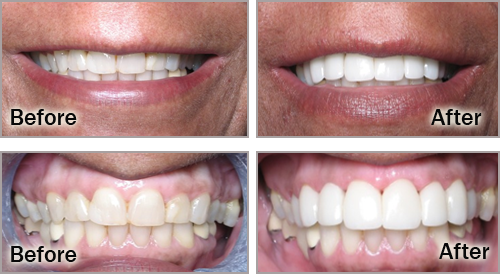 These are select and actual photos of patients treated at Comfort Dental over the past 24 years. We are often asked if the before and after photos are “really the same patient?” None of our photos have been touched up or professionally altered in any way. In fact, we take very simple photos of our patients and do not change them in any way. Some of our work is very complex and challenging, but we love the difficult cases that other dentists are afraid to treat! The changes, in some of our cases, are so amazing and drastic that our readers have a hard time believing that the patient is the same in the before and after photos. We have performed tens of thousands of cosmetic dental procedures for over 24 years and we know that we offer unequaled experience and expertise in this area of dental treatment. Lynetta came to our office with complaints of broken teeth, toothaches, headaches, jaw pain, ear ringing, and neck pain. We treated her initial pain complaints with our TMJ Therapy modalities and then addressed her long term reconstructive needs. Careful planning and preparation was involved due to the complexity of her needs. 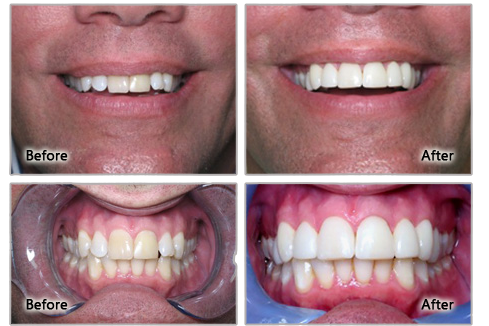 26 All-Porcelain crowns, 2 implants, and 25 years of clinical experience were used to provide a new smile, new bite, and new lifestyle. No more headaches, no more ear pain, no more jaw pain, but definitely a smile to be jealous of. Her bathroom mirror gets a lot of use now! Our 50+ patient had let the thought of Fear and Mother Time take a toll on her teeth. Unfortunately, cavities and gum problems were part of the result of years of “staying away.” With today’s modern sedation dentistry and gentle care, we quickly got our patient back on track. As a matter of fact, after the first visit, she no longer cared to have any sedation administered and realized how easy and painless today’s modern dentistry can be. We had to perform multiple root canals and some selective gum (periodontal) treatment. All teeth were reinforced with titanium posts. Final Empress Crowns were delivered. These full porcelain crowns have no metal, as they are completely made out of the finest porcelain material available today. The patient was also placed on a nighttime bruxing appliance in order to protect the porcelain and improve her sleep. If you are thinking of having extensive work done with multiple porcelain units, please talk to us (or your dentist) about any problems you may be experiencing with grinding, headaches, or jaw pain. It is important that all such issues should be resolved before investing money in such procedures. Porcelain work is susceptible to breakage, more often in patients who grind and clench their teeth. 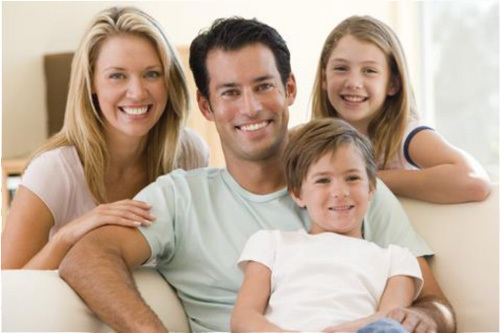 We specialize in complex jaw problems and want your dental work to provide decades of service! Dr A.S. was a long time patient at our office. Medical school, children, and her busy practice prevented her from taking the time to undertake a cosmetic makeover. Finally, she decided it was necessary. Utilizing light gum lift procedures and Emax crowns we were able to do a facelift makeover which practically gave her an entire new look. Due to previous trauma, our young business executive had “put up” with yellow front teeth for many years. His old dentist told him that nothing was possible for his teeth besides bleaching. After careful X-ray examination we found that his front teeth were severely damaged and showed infections in the roots. Many teeth that suffer blows or even minor trauma can undergo slow degeneration and chronic low-grade infections that are hard to detect. It is important that proper X-rays are developed to ascertain the status of the protecting of these teeth. Often, normal examinations can miss such problems. Root canal therapy was performed to stop the progress of the root breakdown and the teeth were reinforced with titanium posts. Brite smile teeth whitening procedure was also completed in order to provide a more radiant smile. AA came to our office concerned about his upper teeth and his smile. Bridgework was able to provide a quick and easy solution to his problem. Future work will provide esthetic enhancement of his lower teeth, but he was more than happy with the results of the upper bridgework that we were able to give him in 2 short visits. YC came to our office many years ago for a consultation regarding her smile. Unfortunately, she decided to go elsewhere and have her work started. As you can see in the before pictures, she did not get very far with her other treating dentist. She decided to make a return visit to our office and follow our recommendations. After repairing this failed work, we proceeded to complete 9 upper crowns along with bridgework and lower Invisalign to correct her smile. She feels like a new person, younger and more vibrant with her new smile. RH came to our office displease with the discoloration on her front teeth and the aging composite work. It only took 3 crowns and lots of skill to give her a new smile. Genetics and Mother Nature combined to effect a longer than average smile for this lovely young lady. The “long tooth” appearance was not attractive to her and she desired a change. After attending to multiple dental needs (gum disease, cavities, infections, etc.) we decided to proceed with a gum lift procedure in order to raise the level of her smile by reshaping her gum line. 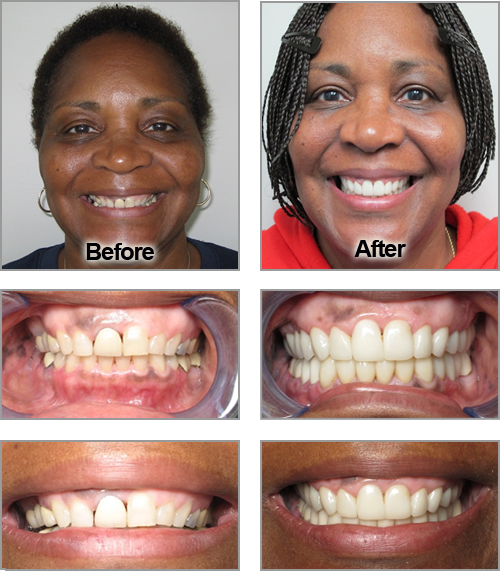 After healing, we designed 6 carefully crafted Dicor crowns in order to reshape her smile, lips, and face. As you can see, a more youthful and energetic appearance was accomplished with her smile makeover procedure. Many of our cosmetic cases are performed on patients who have jaw dysfunction, bad bites, headaches, jaw pain, migraines, tinnitus, and other head pain issues. Many of our full mouth reconstructive cosmetic cases are done as part of a comprehensive rehabilitation program for patients who suffer with these pain issues. If you are considering this type of care and have been looking for a second opinion we caution you to get all of the information you need before you start this type of treatment. Full mouth reconstruction requires tons of planning, neuromuscular EMG studies, and preliminary lab work. Do your homework!!! For individual needs please call our office at 248-646–2273 to schedule an appointment and learn more about our computerized simulation system, which can show you what improvements may be possible for your smile before any work is done.